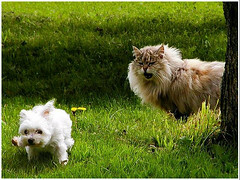 Itchmo: News For Dogs & Cats » Blog Archive » Get Off My Property! I cannot believe that dog rubbed his dirty bottom all over my lawn. Next time, I’m going to call the cops. This entry was posted on Sunday, May 27th, 2007 at 3:50 am	and is filed under Cats, Dogs, National Dog, Cat & Pet Info, Art & Pictures of Cats & Dogs. You can follow any responses to this entry through the RSS 2.0 feed. Both comments and pings are currently closed.